When it comes to getting organized, sometimes getting started is the hardest part. Around here, the year has gotten off to a slow start and yet, January seems to be flying by at the same time! For me, this weird start to the New Year can be explained by two things. Thing one: The first Monday of the year didn’t happen until January 6. And thing two: My kids have been out of school for an extra five days (and counting!) due to winter weather. The end result is a slow start and a lack of the momentum that usually happens in the beginning of the year. Maybe you’re feeling this way, too. In past couple of days, several people have mentioned to me that they’re procrastinating and lacking motivation. But, the whole year doesn’t have to be lackluster just because the year is getting off to a slow start. Let’s rally together and use these ideas to create some momentum! So often this behind feeling is one that is pretty arbitrary. Who says we have to create momentum on the first, or by the first Monday of the year. Let’s start today! 2. Tune into your cravings. I for one am craving some structure and routine. Vacations and having the kids off of school are great…for a while. In the beginning the change of pace is refreshing, but too much of a good thing has turned the relaxed feelings into lethargy. I know I’m craving routine, but I’m not getting it from school like I normally do…so it’s time to tune into my cravings and set some structure of my own. How about you? What are you craving? What can you do to fill that need on your own, if you’re not getting it in the usual way? Nothing can derail motivation quite like feeling overwhelmed does. If you are feeling overwhelmed, try to figure out the root cause. Usually when I’m overwhelmed it’s because I’m trying to think about or do too much all at once. The best way out of this is to create a quick list and get everything out of my head and onto paper. Then, pick just one thing to focus on. 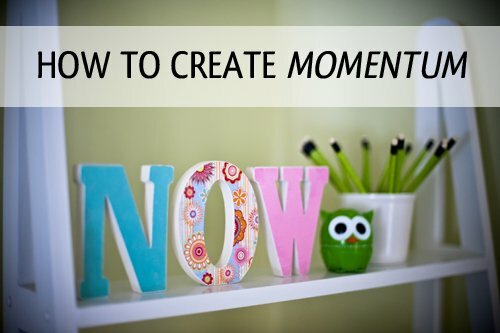 This step alone can help create momentum, as you stop being bogged down by too many things vying for your attention. 4. Take a small step forward. Once you’ve picked one thing to focus on, take a small step forward. Spend five minutes making progress, or do just the first step in a multi-step project. Giving yourself permission to start small, believe it or not, will help you create momentum, and often, the desire to keep moving forward. Ahh…I think we just might salvage 2014 after all. Are you lacking momentum or feeling behind, too? Or are you feeling overwhelmed and unsure of how to start? Please share your thoughts in the comments below. I’d love to hear from you! Here’s to creating momentum and a creating a terrific 2014. My kids have had an extended time of as well, with an ice storm resulting in loss of power, to the overdose of snowfall. Wednesday (yesterday) was there first day back and I’m feeling like I can get back my momentum now. Thanks for that nugget of getting things out of your brain and onto paper. I am going to make my list right now because I keep losing my place in my head and not getting through any project completely. Happy New Year! Happy New Year to you, too, Susan! I’m feeling behind because we traveled over the holidays for the first time, and that has pushed everything else back. We try to do a big clean/clean out of the kids’ rooms over the winter break, and I got a late start to it due to our long (and wonderful!) vacation. Since that’s not finished, I haven’t taken the Christmas decorations down, and as we creep closer to the middle of the month, it makes me feel a bit panicky! I’ve made the big list, but truth be told it still makes me feel icky. Meanwhile, school has begun and so have all of our regular obligations. Aggghhh! The good news is, I should be finished with the boys’ rooms tonight, I am just going to delay doing my daughter’s room and not worry about it, and Christmas will be fully down and stored by the end of the weekend, if not earlier. One foot in front of the other, right?! Thanks for letting me vent! That’s right, one foot in front of the other. One small step at a time. Great ideas to make new goals, so glad others feel the same way I do! Glad to see this info. Thanks! I had an awesome start to this year but then a day of not feeling well; another unrelated problem crept up and I spent most of a day sitting in the clinic and hospital (all is OK now) but a whole day was lost. This afternoon didn’t work out as planned because of a meeting I was not aware of until the last minute. So… I was beginning to feel like all was being lost until reading your post a few moments ago. I will take a step or two forward before bedtime! Welcome, Kay! Glad you’ve found our site, too. Here in Australia we have a long school holiday over Christmas…yes our summer break….kids aren’t back until 30th January…so yes it is hard to get back into a routine ! Oh I bet it would be tough! Love how things are different around the world…I can’t imagine Christmas happening during summer break. I definitely have the January post holiday blues and blahs. Over the holiday I was so inspired by the organizational headway I was making at home. Now that we have had our first week back at school and work, I feel so behind again. I need the momentum to not get discouraged. Even the thought of writing stuff down is overwhelming since it shows how much I have to do. Any suggestions? I would suggest writing it down anyway. I think that the list always seems worse in our head (no matter how bad it is on paper) because we have to keep thinking of the same things over and over again to keep track of them. When you get the list out of your head and onto paper then you can focus on just one thing at a time…and you can check things off which will help you see and recognize your progress. Good luck. As I like to say, you aren’t behind if you’re moving forward. Hi, Aby! I’ve gotten a slow start too! Even down here’s in TX, it’s been very cold. Then I got a flu shot, which always knocks me for a loop, & lastly I had 3 days straight of a terrible migraine. Thankfully, I’m feeling much better now & am ready to get organizing! Thanks for all your helpful tips & motivation!!! Oh sorry to hear you haven’t been feeling well! Glad you are feeling better now! !